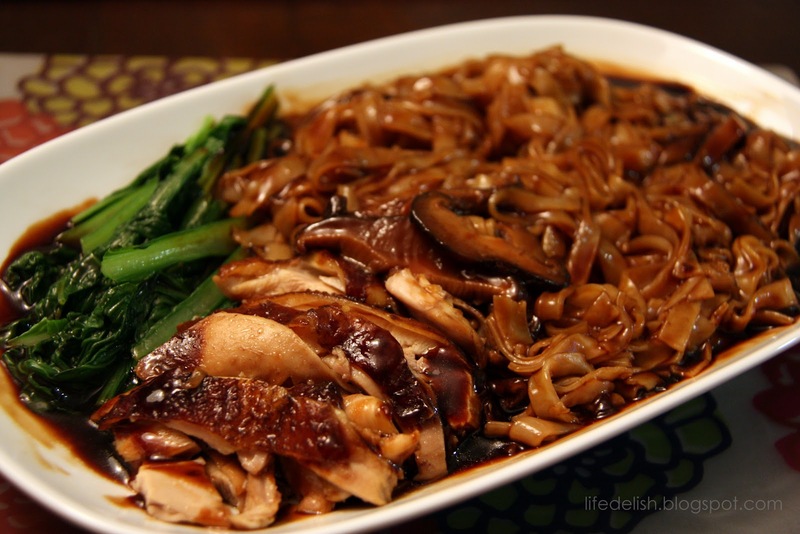 For a number of years through my late teens to early adulthood, one of my comfort foods had been the Shredded Chicken and Mushroom Ipoh Hor Fun from the coffee shop at the corner of River Valley Road and Kellock Road. To me, that was how Ipoh Hor Fun was supposed to taste, and I could never satisfy a craving for the dish until I got my fix of it there. Sadly, the elderly man who used to cook at the stall eventually stopped doing so, and now the coffee shop premises itself has been taken over by some other F&B establishment. So for some years now, I feel like I’ve not had a proper plate of Ipoh Hor Fun. I hardly even order it these days as chances are I’d just be disappointed. Finally I figured I should try to make my own version of Ipoh Hor Fun. Today I took my first stab at it. The dish is really about the hor fun gravy at the end of the day. And the flavour I was trying to achieve for it was something akin to the gravy which comes with the soya braised chicken from Lee Fun Nam Kee at Block 94 Toa Payoh Lorong 4 (which I get a craving for every once in awhile – it’s so good!). Basically I cooked a braised soya chicken (garlic, ginger, spring onion, dark soya sauce, sugar, salt, sesame oil, five spice), then used the sauce as a base for the gravy, adding to it kecap manis, more sugar, salt, pepper and corn starch to thicken it. Taste-wise, I dare say it wasn’t too far off, but there is much room for improvement since it was a first attempt. As this recipe is a work-in-progress, I shan’t post it for now. Now come to think of it, when I was a little girl living at Marine Parade, there used to be a stall at the hawker centre close to the building which housed Metro Department Store and Yamaha Music School, from which I would order Shredded Chicken Ipoh Hor Fun as well. It was the only thing I would eat at that hawker centre. But now I don’t even remember how it tasted. Speaking of this reminds me that recently, the idea came to me that I should try to recreate all the dishes I used to enjoy in my childhood. After all it would mean all of 3 dishes or something, including Chicken Maryland from the then Cappuccino Coffee House at Plaza Singapura and Open-faced Roast Beef Sandwich from Silver Spoon at Supreme House. I used to be a scrawny little creature with huge teeth, and my mom constantly agonised over how I was so hard to please when it came to food.